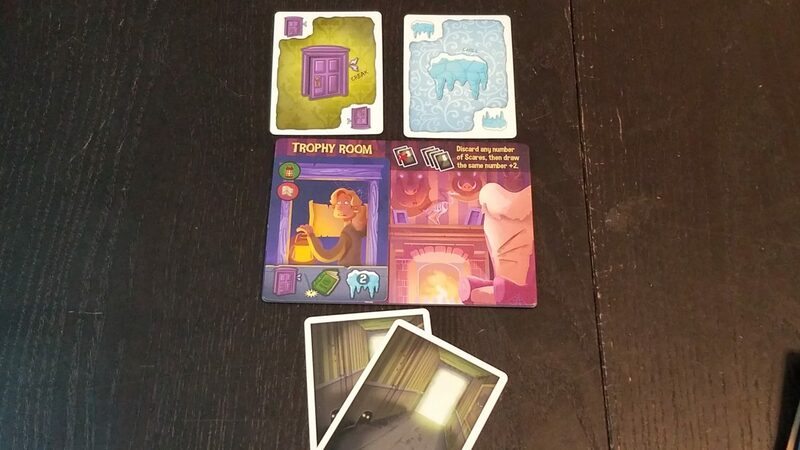 Haunt the House is a fantastic family-weight game of playful haunts and terrified ghost hunters. 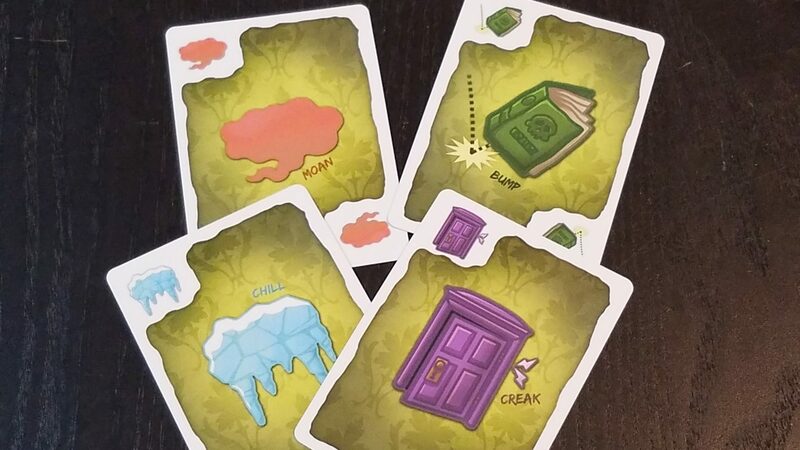 The set collection gameplay core is really accessible, and the press your luck elements and memory components make it work just as well for more experienced gamers as well as younger spooks. In Haunt the House, you and your cadre of fellow specters find your haunted mansion being invaded by curious (if ill-fated) ghost hunters. What’s a group of ghosts to do? Josh: Haunt the heck out of them, that’s what! Jess: Yeah! Let’s see which of us can see which of us can terrorize these goofballs the best! Well then. There you have it. Gameosity was given a copy of Haunt the House for review. We were not otherwise compensated. In Haunt the House, curious ghost hunters will show up in various rooms throughout your haunted house, and each one is only frightened by a particular combination of Scares. Andrew: FAMILY GAME. IT’S A FAMILY GAME. 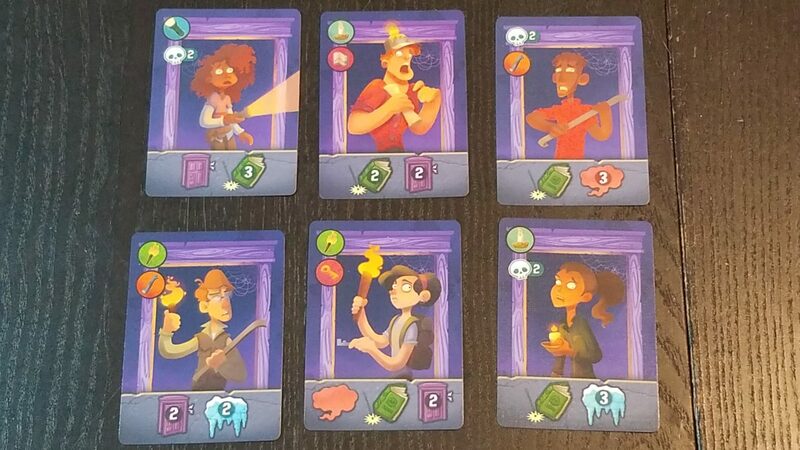 On each player’s turn, they will either contribute Scare cards to the rooms where the Ghost Hunters explore, or they will yell BOO! to try and spook a hunter for points. When cards get added to a room, they can either be placed invisibly (face down) or visibly (face up). Placing cards face down obscures your actions from other players, but placing them face up will activate the special powers of the room, which are always to your advantage! Each room has a unique effect, and they get swapped out every time a hunter gets successfully spooked. Once a player yells BOO!, the room they indicate is scored. All face-down Scare cards are flipped face-up (regardless of who contributed them), and players check to see if the total scares added meet the hunter’s unique scare combo. If it is met, then the player who yelled BOO! gets to grab that hunter’s card as a trophy for points. If not, then the player can either supplement with Scares from their hand, or they have to discard the scares and try again on another turn. After any player scares their 4th hunter, the game ends and points are tallied! We absolutely love the art throughout this game. It’s all fantastic! Josh: One of the great things about Haunt the House is how simple and accessible the rules are. Our summary isn’t all that abbreviated, and the rulebook is really well laid out – perfect for teaching younger gamers. Jess: Totally! But more than that, Haunt the House is fun. I love how it combines some memory elements with bluffing and press your luck – If you see a big pile of face-down Scares being added to a hunter, do you risk yelling BOO! and hoping the right cards have been piled up? Andrew: And can you keep track of the cards you yourself have contributed to various rooms? With multiple hunters to manage and everyone contributing cards constantly, it can really be a challenge! Josh: And that’s without thinking that maybe some players are dumping face-down Scares that don’t match the hunter to bluff other players into thinking they’re ready to be scored! Just because this is a family-weight game doesn’t mean there’s nothing to keep you occupied! 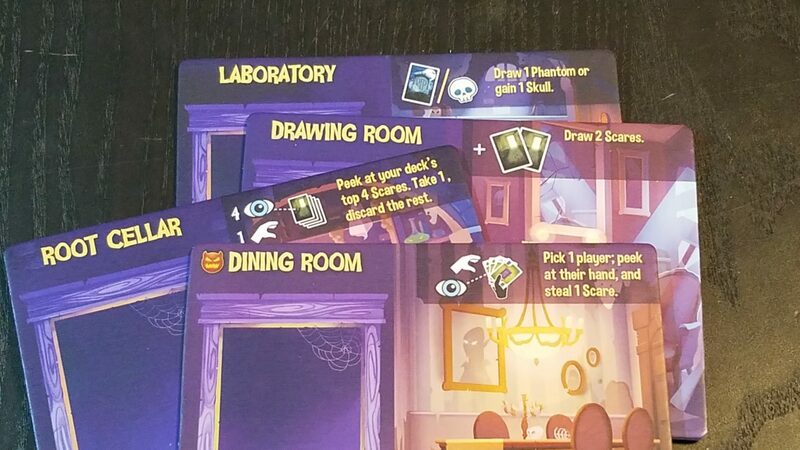 Honestly, Haunt the House is clean, simple, super-playable fun. There’s just enough strategy that it kept us entertained, while still being accessible enough that it would fit perfectly with any family-weight game night. And while the theme is scary ghosts and eerie haunts, the cartoony art is really great and way more funny than frightening. 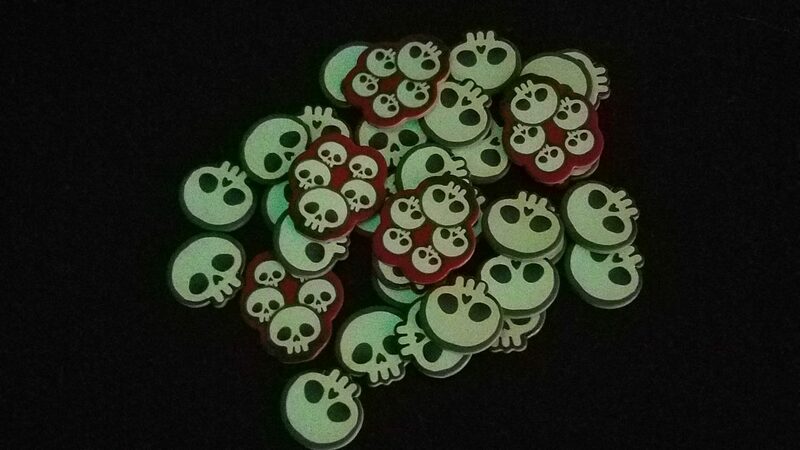 Jess: I mean, the score tokens glow in the dark! How can you beat that?! Andrew: You can’t! And personally, I feel like it’s always worth adding the optional Phantoms mini-expansion when playing with anyone other than beginner/younger gamers. 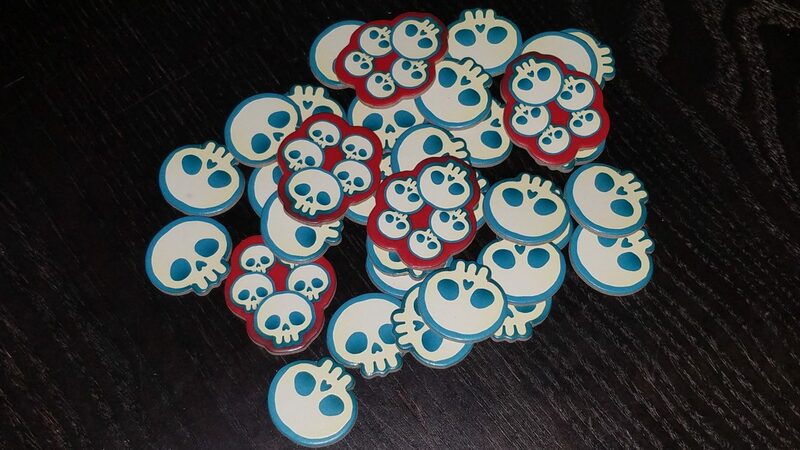 The Phantoms add an additional gameplay element – a deck of cards that players will draw from as haunts get resolved. 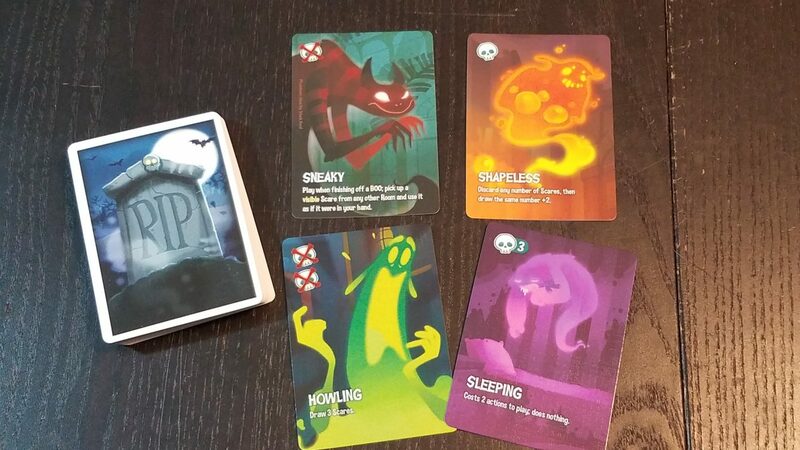 These Phantom cards allow players to manipulate scares, move cards around, score bonus points, and mess with each other a bit, adding more depth to this fun, quick game. Phantoms add interaction and options. Josh: And even with the Phantoms, the ones which have direct player contention are clearly marked and can easily be filtered out if that’s your preference! Have the haunting experience optimal for your group! 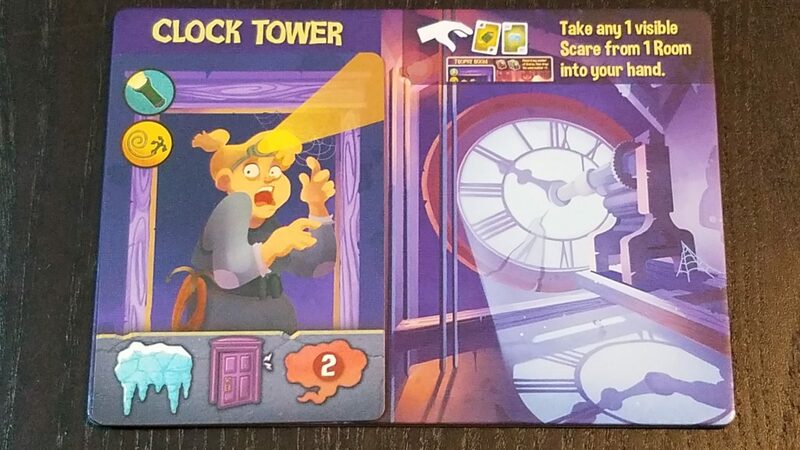 All in all, we had a great time with Haunt the House – it’s quick (easily played in under 30 in our experience) and easy to learn, but solid fun for the whole time it’s on the table. 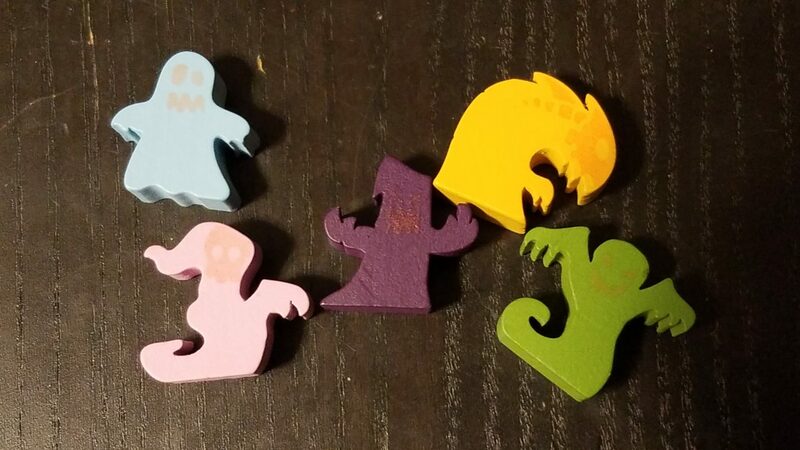 Perfect for your Halloween-themed game night or just anytime you’re looking for a family-weight game to snack on, Haunt the House is welcome in ours anytime.